Ill mind Russian President, Dmitry Medvedev visited Kunashir, which is the territory of Japanese Island with no permission to Japanese agreement. | Hey, you know what? ホーム > スポンサー広告 > Ill mind Russian President, Dmitry Medvedev visited Kunashir, which is the territory of Japanese Island with no permission to Japanese agreement.ホーム > Russia > Ill mind Russian President, Dmitry Medvedev visited Kunashir, which is the territory of Japanese Island with no permission to Japanese agreement. Ill mind Russian President, Dmitry Medvedev visited Kunashir, which is the territory of Japanese Island with no permission to Japanese agreement. On November 1, Russian President, Dmitry Medvedev visited Kunashir that had been invaded since the time of Soviet Union’s aggression to Japanese territories. The purpose of this is apparently related to the territorial dispute with Red China regarding SENKAKUS. As many of you know that there are four Islands in the north of Hokkaido, Kunashiri, Habomai, Shikotan,and Etorofu. 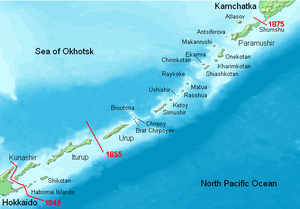 Before World War 2, there used be Japanese inhabitants on these islands as Japanese territory, but due to the incident of a sudden military invasion by Communist Russian, STALIN, all of Japanese people had to move to Hokkaido to avoid dangers of their lives abounding their houses and properties. and Kunashiri, STALIN used many sneaky ways to rob Japanese territories. He spoke to General MacArthur to share Hokkaido as a half the U.S. territory and the other half was Russian territory. But MacArthur did not get on this idea. I believe this was the turning point of Korean War and the Cold War with two different political and economical ideologies. Anyway, after the Japanese surrender of World War 2, according to the San Francisco Peace Treaty, Japanese Government was forced to give up the territorial right to the South Karafuto, the Chishima Islands, but not Kunashiri, Habomai, Shikotan,and Etorofu. This is the first time that the top of Russian president visited Japanese territory, ignoring the historical facts and evidences. Even including the time of Soviet Union, no high ranked officials visited the unlawfully occupied Japanese Islands. We Japanese strongly protest Russian President, Dmitry Medvedev and his government to this outrageous conduct. If Russia Keep doing such idiot things, no nation would consider Russia as trustable and reliable partner in many fields, such as economical, business, environmental aspects in the world. By the way, the U.S. has immediately announced that she was with Japanese side.